This entry was posted on March 30, 2017 at 7:39 am and is filed under Physiology. You can follow any responses to this entry through the RSS 2.0 feed. You can leave a response, or trackback from your own site. Ed Whitlock certainly served (and still serves) as an inspiration to many of us. Much of what I know about him I learned through your site, so thank you for that. I think we all assumed he would go on setting records through his 90s, but it wasn’t to be. I will remember him from a racing photo that you once mentioned… a focused face, hair flowing back, and the strongest stride. Thank you for a beautifully written tribute. Thank you for your comment. I think you are referring to the photo of Ed at age 80, running the Longboat 10 Km on Toronto Island. It is also my favourite photo of him. The master of speed and grace. You have always written very well about Ed and this was a beautiful tribute. Thank you for sharing so much information about the man in all your posts and may he rest in peace. I think we will all miss him. Nice write up had the pleasure of two brief meetings with the man. The second the night before his last marathon in October. What struck me both times was how he seemed as interested in my training as I was in his. Disconcerting given the caliber of my running. A gracious gent. Thanks Canute. I’ll miss him too. Like you, I enjoy running for its own sake but also enjoy racing frequently as Ed did. Replying to malcolmbalk, Ed didn’t do long runs at marathon pace, he just ran for the length of time he expected to take for the marathon. 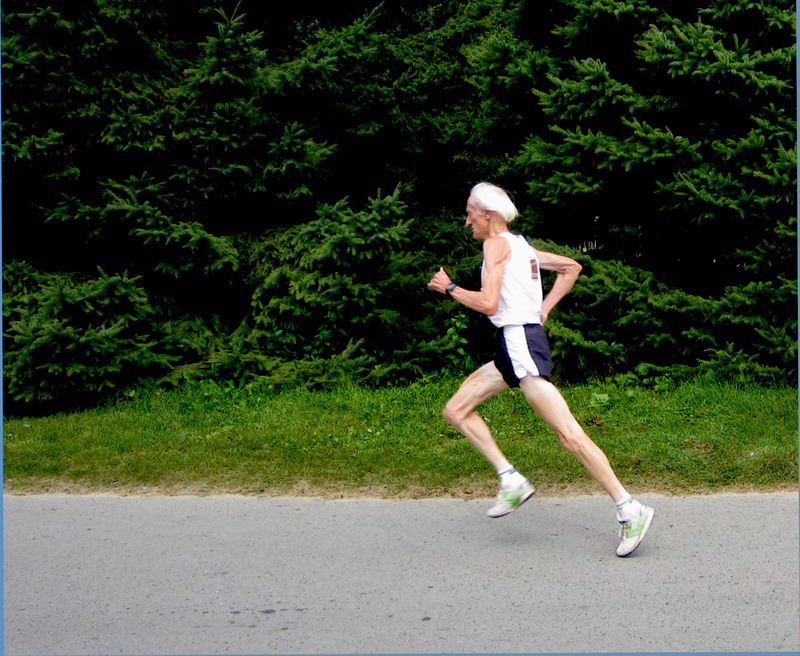 His multiple long weekly runs were quite slow and shuffling. I recall him saying they were barely faster than a walk. Canute: Haven’t seen you poste for a while. I hope all is okay! Very nice tribute to Ed Whitlock. He inspires us all to keep runnin’..
Just recently I have purchased a LumoRun sensor for my iphone and I was wondering if you or others on this site had an opinion of it’s effectiveness? This product promises to provide actionable information (hip drop, rotation, cadence, braking and bounce) on how to improve my running gait. It’s still early days, but I believe that it can be a useful tool to help improve my running efficiency. Perhaps I’ll send a note in a month and give you an update? Again, I trust that all is well in Trenton. S.
Thanks for your comment. I hope to get back to blogging soon. I have had an engrossing but very time consuming year at work that has left little time for blogging. I have also had a few health issues, including two operations for cataract removal, each resulting in 4 week period during which I was advised to avoid strenuous exercise. The good news is that this winter I am not blinded by glare as I cycle home from work in the dark, facing oncoming traffic. The bad news is that four weeks without much exercise, during a period when my baseline fitness was already somewhat depleted by only a modest exercise regime, has left me at the lowest ebb of fitness since I started running to and from school 66 years ago.